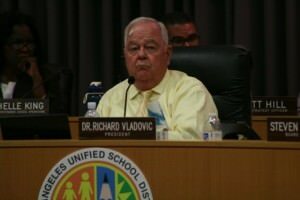 After a tense, four-hour closed meeting with his LA Unified Board colleagues, President Richard Vladovic opened a brief public session admitting that he had violated the district’s code of conduct and apologizing to employees he may have harmed. The sudden admission came two weeks after an outside firm concluded an investigation into allegations of verbal and sexual harassment against Vladovic, some of them from years ago. Details were kept out of public view until Monday night, when district officials released documents involving two accusers. One case described events that could be interpreted as sexual harassment; the other, verbal. In his apology, Vladovic made no specific reference to the charges although his admission of improper behavior seemed directed only at accusations of berating and intimidating employees, rather than any allegations with sexual or homophobic overtones. After the meeting, Trujillo said that Vladovic’s apology was only meant in reference to complaints about his temper. The board spent considerable time in the closed session debating whether to take any punitive action against Vladovic, who was elected president earlier this year. The board has the power to censure him and even remove him as president. But people who were briefed after the meeting said members were unable to reach consensus on what, if anything, to do. It was their understanding that the question lingers and could arise at the board’s next public meeting, on Oct. 29. Vladovic promised he’s a changed man from the one described in the complaints. Before the meeting began, according to the LA Daily News reporter, Barbara Jones, a CBS news crew asked Vladovic about the charges. He said he was “innocent.” Board member Marguerite LaMotte asked him to repeat that louder, then walked over and gave him a comforting kiss on the cheek. Vladovic looked pale and shaken.